I also posted that I was refusing to buy Flashpoint #1. 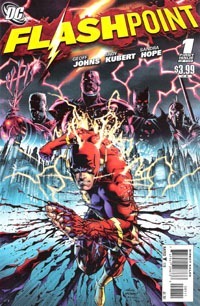 Later that day…I bought Flashpoint #1. The thing of it was…I gave in because I had given in a few weeks back and bought the first issue of Marvel’s Fear Itself premiere. And I also figured that if I was to have any room whatsoever–even just a small toe-in-the-door–to talk about this event, I couldn’t just be someone who hadn’t even done so much as pick up the first issue of the main event book itself. I posted my review the day the issue came out…and it was a bit more positive than I maybe would’ve “liked,” but there’s no denying the “potential,” that Johns has a strong handle on the writing, and that was some great art in the issue. But that doesn’t change the fact that I have every intention of consciously staying away from anything else involved with Flashpoint right now. 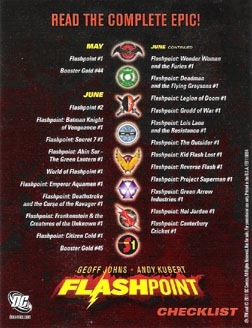 The event’s core book, Flashpoint, is $3.99. I am so sick and tired of the $3.99 price point (more than people are sick and tired of hearing about it from me!) Sure, it’s only 5 issues, but for that $20, I’ll wait for the collected edition hardcover that’ll have the whole mini together in one volume without ads and no waiting a month or 2-3 weeks between chapters. 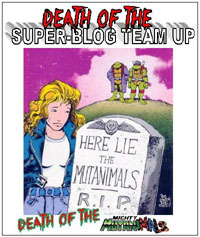 I keep seeing mention of 15 or “over 15” mini-series attached to this event. Even if there are only 15 minis and all only have 3 issues…that’s 45 books. At $3 apiece, that’s a $135 investment ($155 with the core series). But I counted over 20 for June between the minis, Booster Gold tie-in, main title, and a special or two. That’s a $60+ investment in JUNE above and beyond the comics I’m already buying. I can’t afford that. Plain ‘n simple. Quite simply…I’ve got event fatigue. A couple years ago, we had Blackest Night looming…which I’d been looking forward to since it was teased at the end of Sinestro Corps War. A fantastic story that sucked me back into the GL stuff, this epic event drew to a close with a teaser of something even grander…and that kept me around, no matter the intervening issues–I wanted to be there for Blackest Night. And I had already set my mind to it: I was on-board whole-hog. If it was tied in to Blackest Night, I was going to buy and read it. I was following THE ENTIRE event, the full story, not cherry-picking it and maybe missing out on a great detail or moment here or there. 70 issues into the mass, I was counting down to its end–not so much for the grand finale, but so I could at last be done with buying so many comics for one story! And it seems that from both Marvel and DC, there are all these events, simply put, the fun’s gone out of it for me. This also ties back to the pricing. While these monster events are huge and epic and way too expensive…I have less problem with the smaller events. Much as I dislike so much from Marvel, I’ve really enjoyed their X-events. Last year’s Second Coming was great–it was 14-15 chapters (roughly weekly) with several tie-ins/specials on top of that. 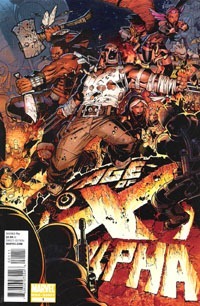 And more recently, the 6-chapter plus a prologue and 2 tie-in specials Age of X was presented within 3 consecutive issues each of X-Men Legacy and New Mutants. Not a 6-issue mini that had 6 more tie-ins then a couple special issues. DC’s had Blackest Night, then rolled right into the Brightest Day stuff, now on into Flashpoint, and who knows what next. It’s gotten to where it seems like many stories–however GOOD they really may be–there’s too much HYPE for my taste. Sure, knowing what’s coming up, what’s going on, and so on–that’s good. But having the wardrums beating for months beforehand, everything proclaiming the sheer awesomeness of the new event…it’s not gonna live up to it. And it’s hard to tell sometimes if there’s genuine individual interest…or if it’s just participating in the “it” thing of the moment. I’ve become very much a collected-editions person. I prefer to have the stories on the bookshelf, easy to see what I’ve got where, pull a particular story, take it with me, put it back for later, and so on…rather than trying to keep track of all the issues of a given story for 6+ months running if I want to read it all at once. And with Flashpoint–after seeing the way the bulk of Blackest Night was collected–strikes me as something I’d rather just wait for the collected volumes for. Surely they’ll have the core series as its own volume; but for the various minis–which look to mainly be 3 issues apiece–double or triple them up by similar corners of the Flashpoint-DC-Universe–and we’re still talking a LOT of books. But at least they’ll be all together, and able to be read without waiting a month for the next chapter (especially on 3-issue minis…those just seem way too short after so many years of the “standard” 6-issue arc!). And while I have no intention of abandoning my local comic shop, shame of things is–other than random sales on stuff, the shop can’t compete with the likes of Amazon or DCBS or whatnot. 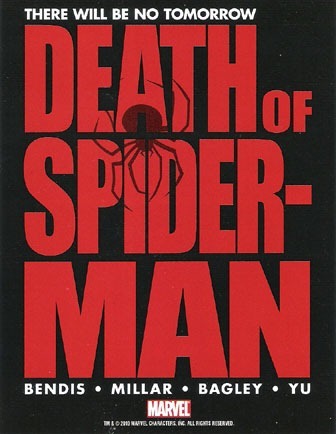 Order these collected editions through one of these and I’ll save probably 35-40% on any volumes I’d get, which would be quite the significant savings off what I’d pay for single issues of all the stories. I’m not the target audience anymore. I can’t afford to keep up, all the more as the FUN in keeping up isn’t there. I can’t keep riding the wave of new comics– there’s just too much out there. I’m about to scale my pull list way back…first time for this pull list, but hardly the first time in recent years that I’ve made dramatic cuts in what I’m buying regularly. 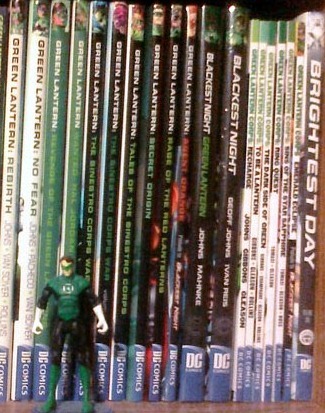 A couple months into Brightest Day last year, I dropped everything Brightest Day…even the Green Lantern books (though I’m itching to read the collected volumes for Brightest Day itself, Generation Lost, as well as the Green Lantern/GLC volumes; and definitely looking forward to the collected edition of War of the GLs). Not long after, I dropped the Superman family of titles. I was dropping Superman in “protest” over the lack of Clark Kent and very little interest overall in Grounded; and again–easier to drop the whole family than be taunted and teased by stuff in whatever title(s) I’d keep. So…pricing, quantity of titles, format preferences, event fatigue…whatever the hype, Flashpoint–as single issues–is not for me. I bought the first issue, gave it a token chance to hook me…but it wasn’t enough. Didn’t live up to the hype, didn’t do enough to hook me into buying the various minis. 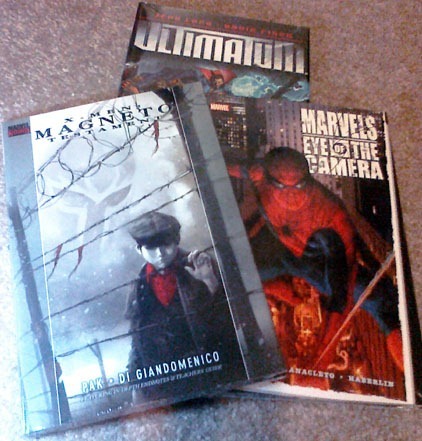 I’ll revisit the event when the collected volumes come out–maybe try to get ’em then. Or at least, hit the libraries for ’em.